What if you could get a gun with the barrel of a pistol and the caliber and stability of a rifle, all without having to deal with pesky federal regulations? Thanks to AR-15 pistols and pistol braces, you actually can. Yes, AR pistols are a bit of a novelty gun to some, and to a certain extent, AR pistol braces can be too, but that shouldn’t overshadow the fact that they’re a ton of fun to shoot with and can actually be extremely practical. AR-15 pistols are, by nature, hard to manage. 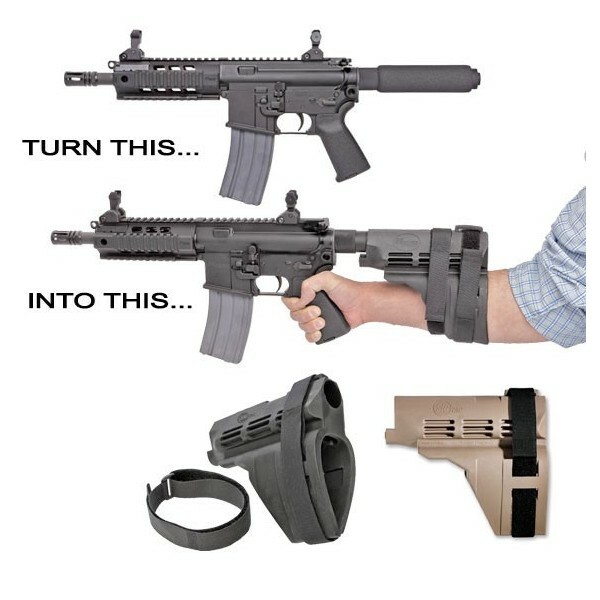 Pistol braces, however, turn AR-15 pistols from barely more than a range toy to a practical, usable firearm by offering real stability–whether you choose to shoulder them or use them attached to your arm. You probably don’t want to use AR pistols, even with braces, for hunting or competition weapon, but they do function well as defensive weapons. They’re particularly excellent in home-defense situations where your assailant will most likely be in tight quarters. without the same legal issues of an SBR. 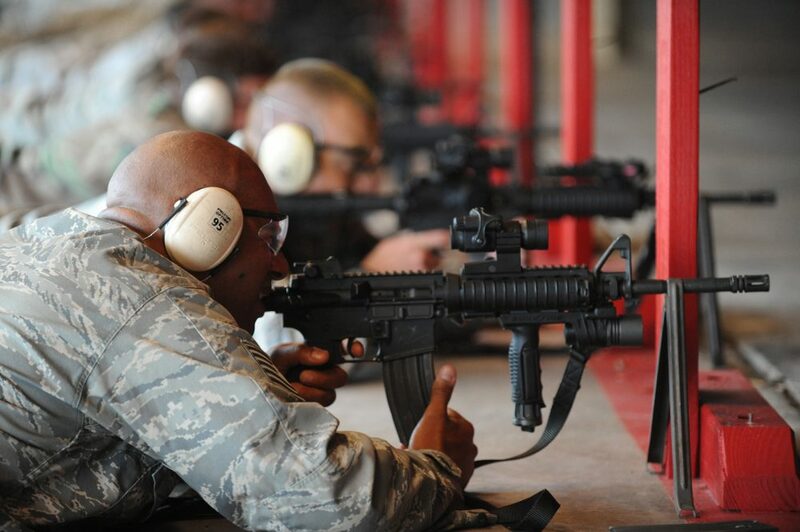 And, again, they’re a lot of fun, so they’re still a great option for just enjoying yourself at the range. 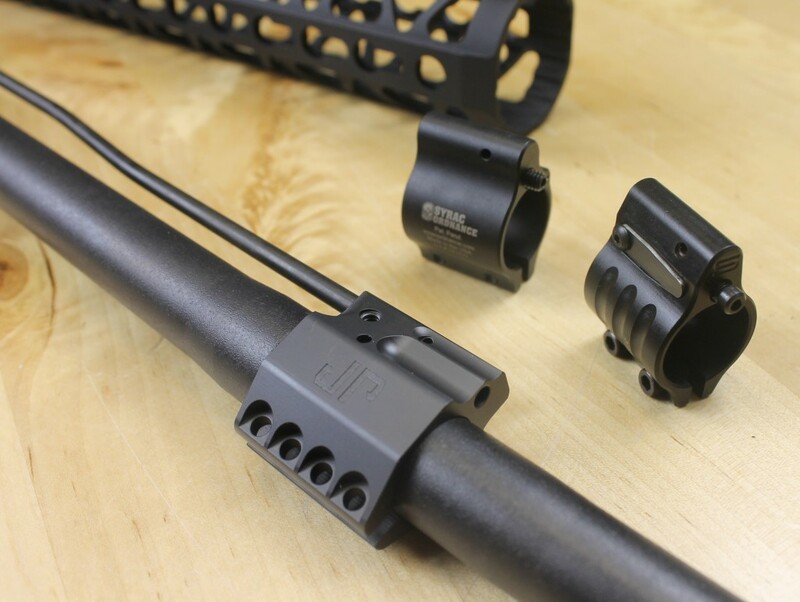 To help you benefit from an AR-15 pistol brace, we’re going to talk about some of the best AR-15 pistol braces on the market–but first, let’s talk about a few legal things. Before we get started, please remember that we’re not lawyers and this is not legal advice. Be sure to double check with current federal, state, and local laws. We’re just here to talk a little bit about how pistol braces came into being, and the laws that made them necessary. Since the introduction of the AR-15, people have wanted a shorter barreled option. However, thanks to the National Firearms Act, getting a short-barreled rifle (a rifle with a barrel length of 16” or less) is a pain. adding another point of contact for your AR pistol. Since AR-15 pistols don’t have stocks, they’re legally considered pistols, rather than rifles, and therefore aren’t affected by NFA regulations for short-barreled rifles. Instead, AR-15 pistols have a buffer tube, which extends back from the rear of the pistol and is held against the shooter’s shoulder. Of course, this gets super uncomfortable very quickly. Fortunately, US veteran Alex Bosco began developing pistol braces in 2012 to combat this issue. 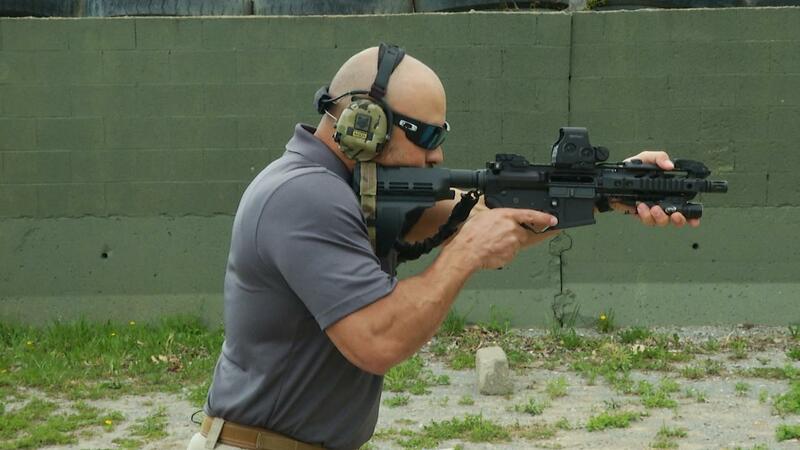 Bosco came up with the idea for a device that would help shooters, particularly shooters with disabilities, exercise more stability over their firearms while spending some time at the range with his buddy, who is a disabled combat veteran. Bosco developed a functional design and got it approved by the ATF (the Bureau of Alcohol, Tobacco, Firearms and Explosives, who is responsible for enforcing NFA regulations), and then co-founded a company, SB Tactical, so that he could continue developing and begin distributing his pistol braces. AR pistol easier than ever before. Pistol braces slide on over the pistols buffer tube, usually relying on friction to stay in place, and attach to your forearm to give you greater stability while you shoot. Now even though pistol braces are designed to attach to the forearm, many people wonder if they can legally shoulder their pistol brace. Up until a few years ago, regulation on this was ambiguous, but in spring of 2017, the ATF released a statement clarifying the issue: you can legally shoulder an AR-15 pistol, even in a pistol brace. With that said, there are still plenty of people, including law enforcement, who aren’t aware that this is the case, so practice caution. One thing that is absolutely NOT allowed is modifying your pistol brace to make it work more like a stock. So, no matter how uncomfortable it is, either live with it or find a different brace. There are laws other than the NFA at play, though. You’ll want to make sure that your lower receiver is indicated as being for a pistol on the DROS (Dealer Record of Sale) when you purchase it. For most people, this will never be a problem, but it can make a difference when it comes to your state and local laws, such as in California. And a receiver marked as a pistol can still be legally used for a rifle build, but not the other way around–so marking your receiver as a pistol gives you more options. To reiterate: always check your state and local laws! 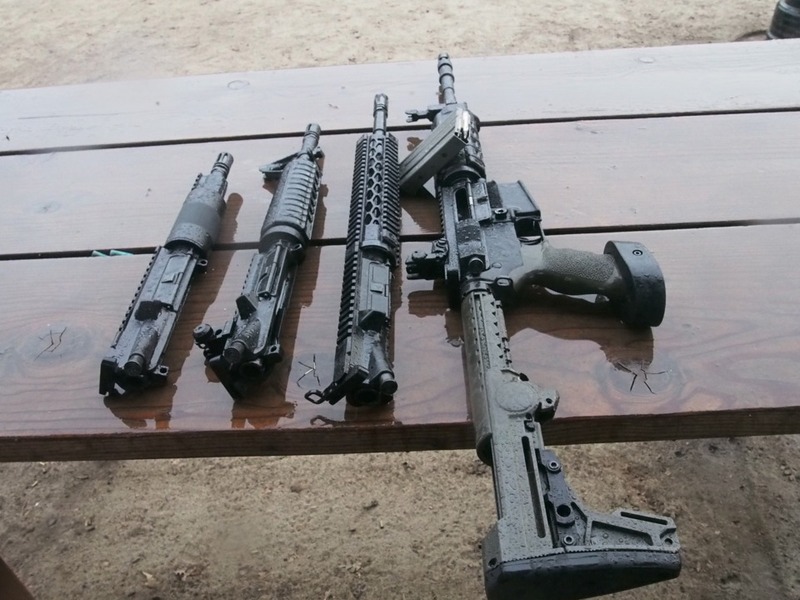 Some of the many varieties of AR pistol braces. Now that the legal stuff is out of the way, let’s talk about some of our favorite AR pistol braces. We’ve gathered a collection of our preferred models, and we’re pretty confident you’ll be able to find your next favorite pistol brace below. The Shockwave Blade from KAK Industries is a basic, affordable pistol brace that is still very effective. It’s quick and easy to install and works with buffer tubes with a diameter of up to 1.25”. Just slide it on the buffer tube and tighten the screw. 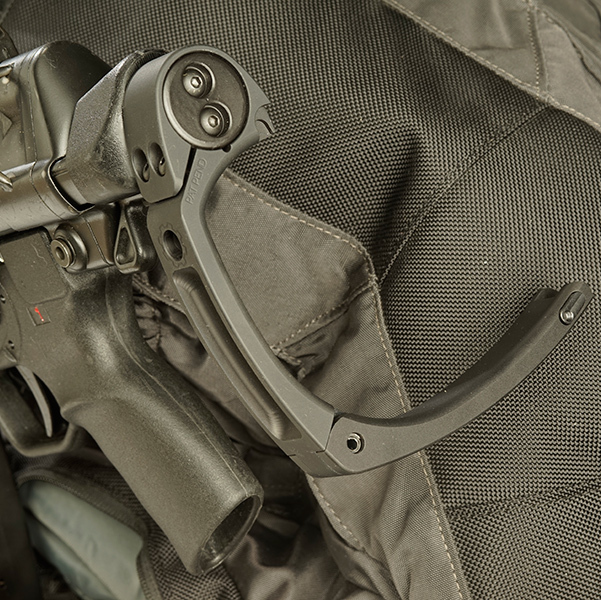 The Shockwave Blade also has three sling attachment points (bottom, center, and top) to allow you to use a gun sling, giving you even more stability when you shoot, plus making it even easier to carry your gun around. But–at just 5 oz.–this pistol brace is already very lightweight. The one downside is that the brace’s cheek weld isn’t the best, similar to the regular Magpul MOE, but that’s not unexpected since it’s a brace, not stock. Just remember not to modify it. The KAK Industries Shockwave Blade comes in a variety of colors. 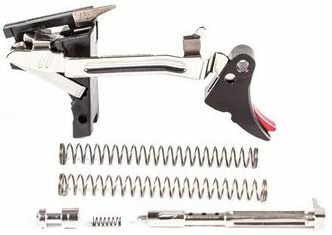 Now if your AR pistol isn’t set up for a pistol brace, you can opt for the Shockwave package, which includes the pistol stabilizer, buffer tube, spring, and all the other components you need for installation. Even if you already have a buffer tube, you may want to go with the Shockwave package anyway for its dimpled tube. Screw the bolt into one of the dimples to prevent your brace from shifting as you shoot. This is the first of several pistol braces on this list from SB Tactical and that’s not an accident. SB Tactical (remember them and Alex Bosco from our history lesson above?) is the industry leader when it comes to pistol braces. With an adjustable, 1” wide nylon strap, the SBM4 is one of the lightest and most comfortable braces that SB Tactical offers. The SBM4 doesn’t fasten as securely as the slightly more affordable Shockwave Blade, but it looks great and is more comfortable than even far more expensive pistol braces. It’s made of a softer plastic polymer than most pistol braces and is designed for superior cheek weld ergonomics to prevent slipping and ensure that shooting feels natural. 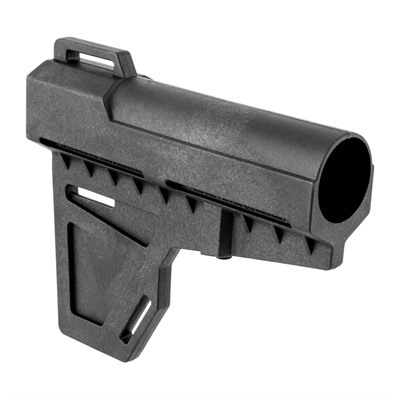 At 8.4 oz., this pistol brace is also pretty lightweight. Comfort may not seem as important as other factors, but you’ll appreciate it after spending a while shooting a high energy round. 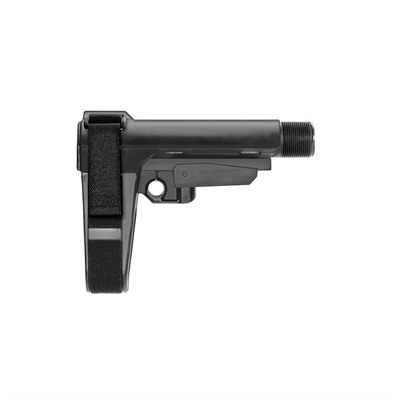 The SBA3 is one of the most widely recommended pistol braces from the leading pistol brace manufacturer. 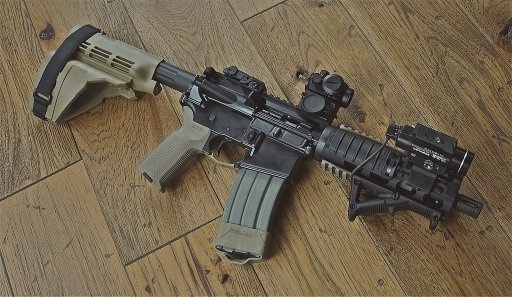 It’s similar to the SBM4, but is more adjustable and is even better looking. 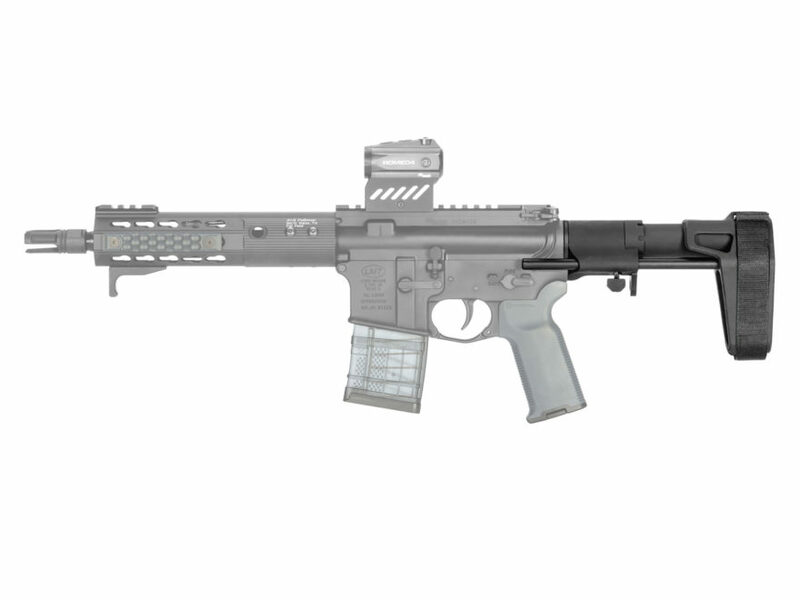 Like the SBM4, the SBA3 is very lightweight (6.75 oz.) and is designed for the best possible cheek weld and the highest possible comfort. It has a built-in and adjustable 1” wide nylon strap, but it also has a five-position adjustable length-of-pull. It also has a QD socket on both sides, great for those of you who prefer shooting with a sling. 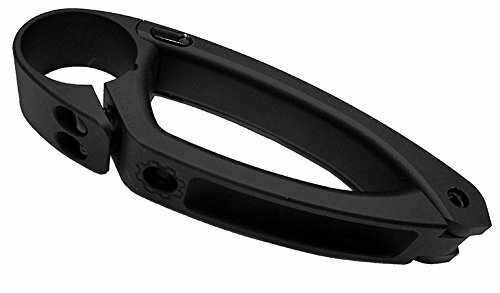 Finally, the pistol brace is designed to look like an authentic AR stock, so you don’t have to sacrifice that AR carbine look you love just because you’re not going through the hassle of getting a short barrel rifle. These extras mean that the SBA3 costs a little bit more than the SBM4, but we think they’re worth it, especially if you’ll be shooting for long periods. 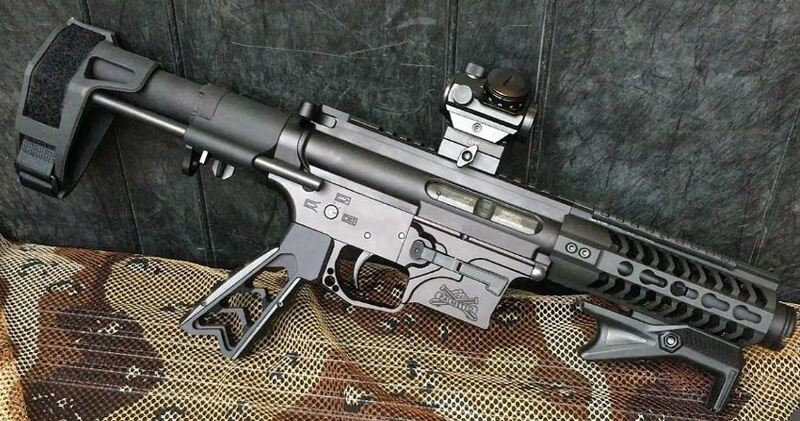 Still another step up from the SBA3 is the SB PDW. 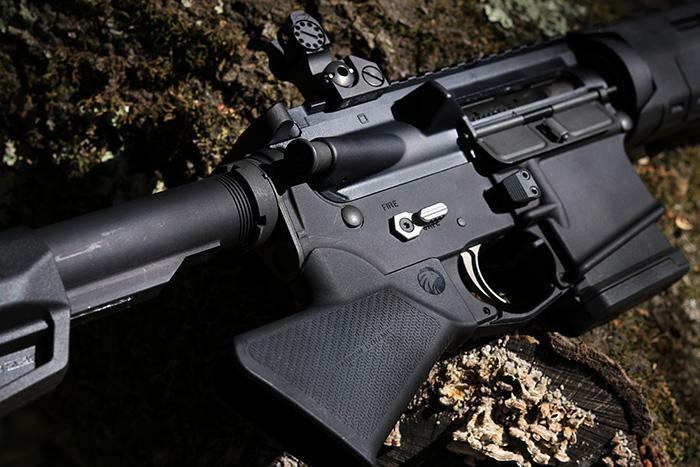 The SB PDW feels like a high-end pistol brace, but without the high-end price tag. It has the same built-in, adjustable 1” nylon strap and comfortable, ergonomic design that the other pistol braces from SB Tactical have. 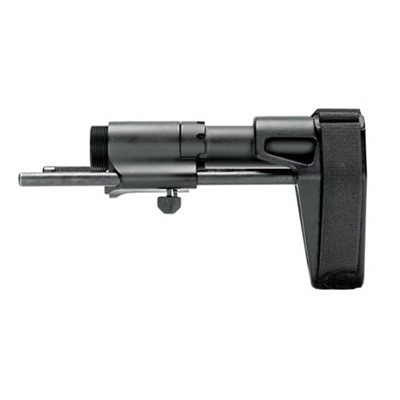 It’s also three-point adjustable to 6.75″, 8.125″, and 9.375″ length of pull and has attachment points on both sides, plus a 6 o’clock QD attachment point. 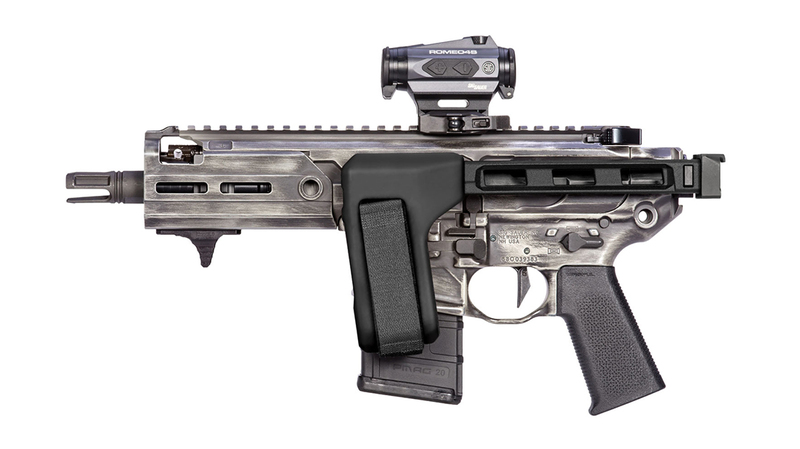 SB Tactical SB PDW mounted on an AR pistol. Finally, everything you need for installation is built in, so it’s super easy to get set up. One thing to keep in mind: at 18.14 oz, this pistol brace is a good bit heavier than the other SB Tactical braces. The FS1913 is a new pistol brace from SB Tactical and the last SB Tactical pistol brace on this list. 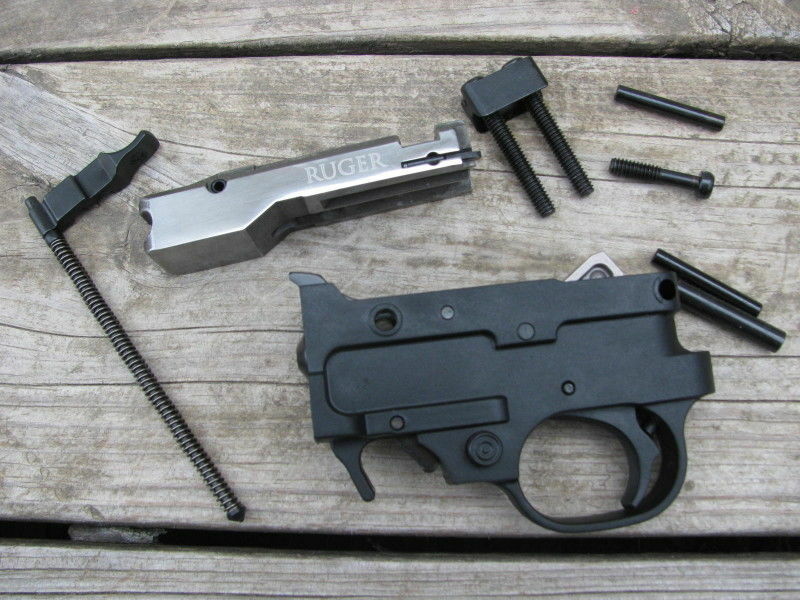 If your AR pistol has an M1913 Picatinny rail system at the rear of the receiver, like the SIG Rattler, SIG MPX, SIG MCX, or Rock River LAR-PDS, a lot of pistol braces won’t fit properly. Fortunately, the FS1913 is designed specifically to work with pistols like these. 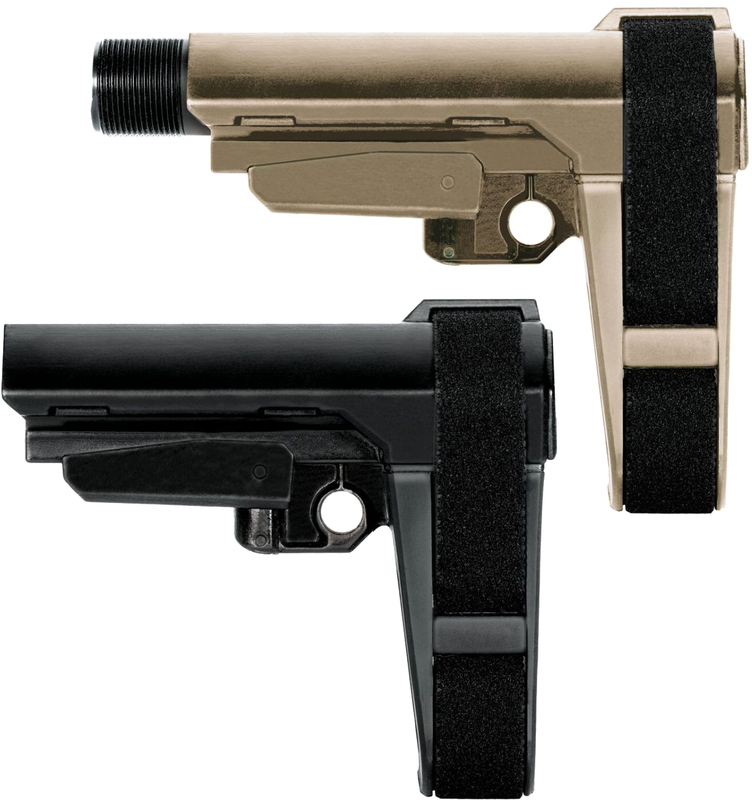 Like the rest of the SB Tactical pistol braces we’ve discussed, the FS1913 has an adjustable built-in nylon strap, but unlike those braces, the FS1913 folds to the left side, making it great for compact storage without having to remove the brace from your gun. It’s made of aluminum and nylon to keep the pistol brace lightweight. For a similar pistol brace that’s collapsible rather than folding, you might want to go with the SB Tactical MPX PSB instead. The Maxim Defense CQB Pistol PDW brace is the most expensive pistol brace on our list and one of the priciest pistol braces on the market. 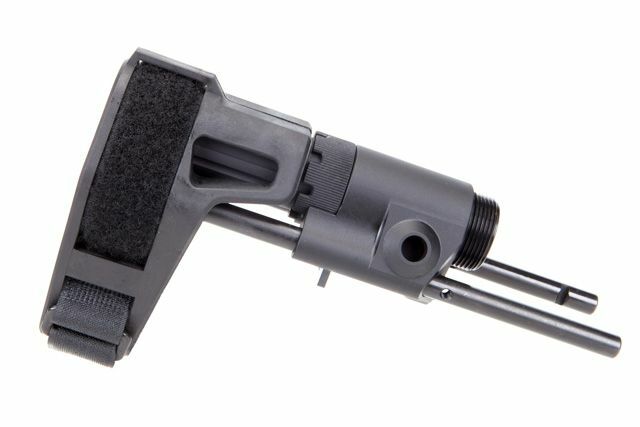 You certainly get a lot for your money with this pistol brace and serious AR pistol shooters will likely get a lot out of it, but casual shooters probably won’t reap enough benefit from the CQB Pistol PDW brace to make it worth it. The brace is built on the same aluminum alloy housing as Maxim Defense’s CQB stocks, which keeps it lightweight and incredibly durable. The part that actually braces against your shoulder, however, is covered with soft rubber, making the brace very comfortable to shoot. 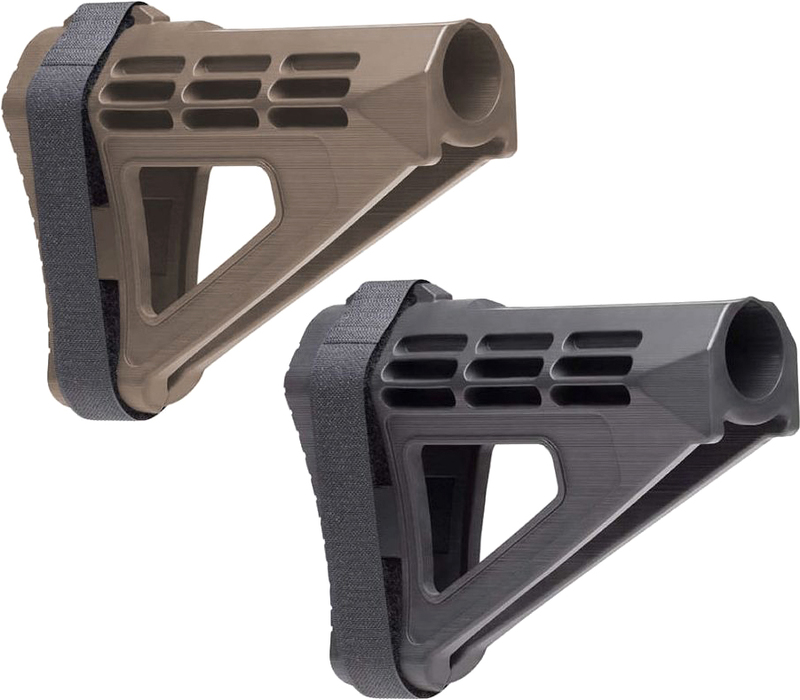 The brace has four points of length adjustability, ranging from 5.375” to 9.24”, and it’s easy to switch among them using a lever on the side of the brace. It’s also incredibly easy to install since everything you need is built-in. Finally, the Maxim CQB Pistol BDW brace has QD mounts on each side. Last on our list is the Gear Head Works Tailhook MOD 1. It’s a basic pistol brace that’s still got plenty of great features. 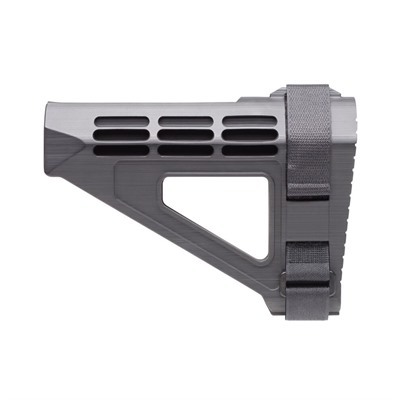 It’s made of durable, lightweight aluminum with a hard anodized finish, though unlike the Maxim CQB Pistol PDW brace, the Gear Head Tailhook MOD 1 doesn’t have any kind of padding to make it more comfortable to shoulder. On top of reducing weight and making the Tailhook MOD 1 generally more convenient, the sleek, compact design also just looks great. Building on this theme of simplicity, the Tailhook MOD 1 is easy to install and use. It works a little differently from other pistol braces, though. 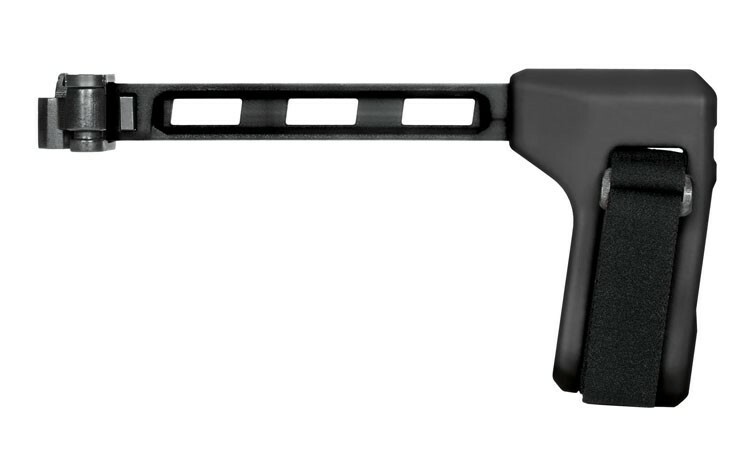 AR pistol, rather than a strap. Instead of using a strap that wraps around the forearm, the Tailhook MOD 1 has an arm which is released with the push of a button and rests under your forearm. From here, it counterbalances the weight of your pistol. 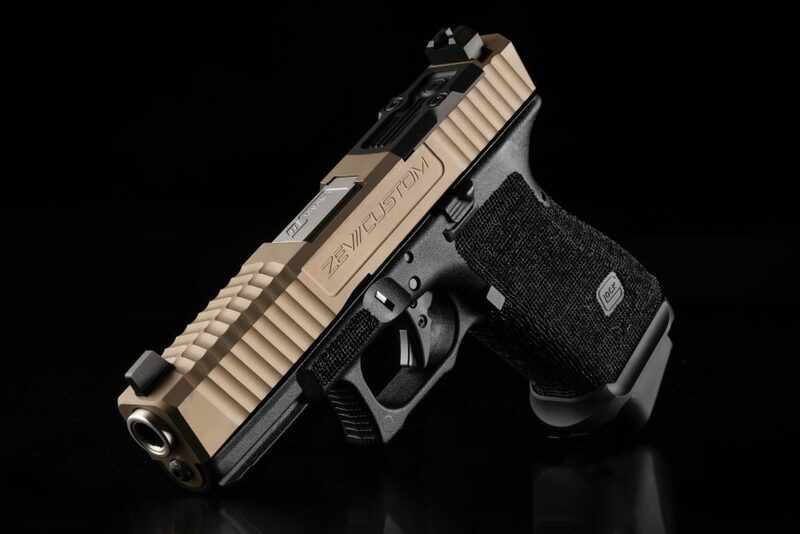 This allows you to support the weight of the pistol while also keeping your wrist and hand relaxed, and allows you to shoot completely single-handed as you don’t have to rely on a second hand to affix the brace to your arm. The Tailhook MOD 1 can be set up for either dominant hand and has a limited rotation sling swivel QD socket. It can be used with buffer tubes between 1.17” and 1.2” in diameter. Those are our favorite pistol braces on the market. We’ve included braces for a variety of price points, ranging from budget-friendly to luxe and high-end. Each has its own strengths and weaknesses, depending on what you want to be able to do with your AR pistol. The SB Tactical SBA3 and SBM4 are probably the most widely recommended AR pistol braces and are both solid options for a variety of uses, while the KAK Industries Shockwave Blade is a good pistol brace for those with relatively limited budgets. 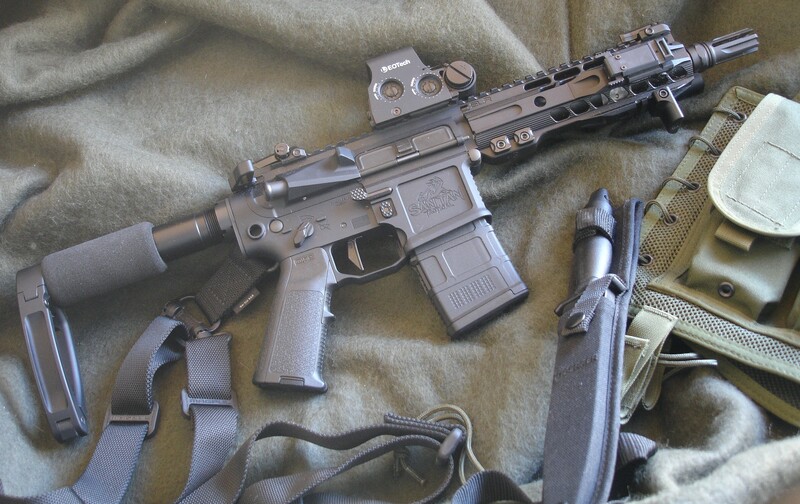 We’re fans of using a pistol brace with an AR pistol. If having rails is essential, then go with the SB Tactical FS1913, but if you have to have a one-handed operation, you need the Gear Head Works Tailhook MOD 1. 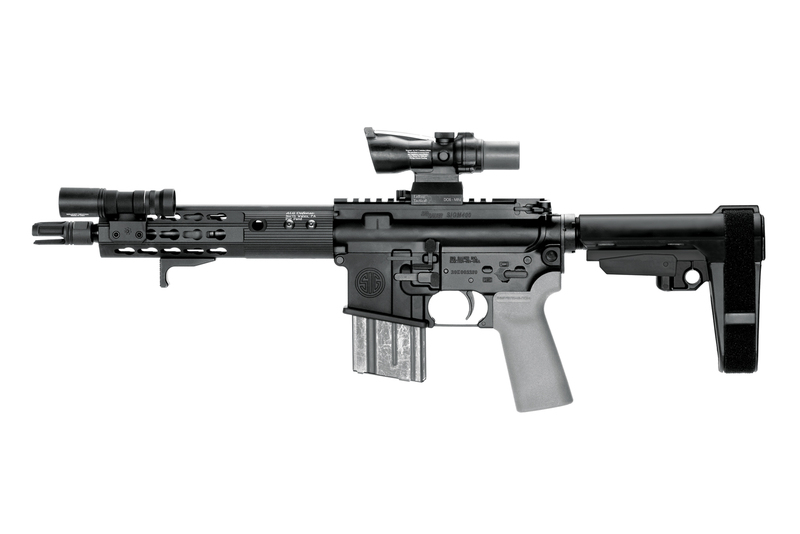 And if you want a high-end experience, either the SB Tactical PDW or the Maxim CQB Pistol BDW brace will serve you well. 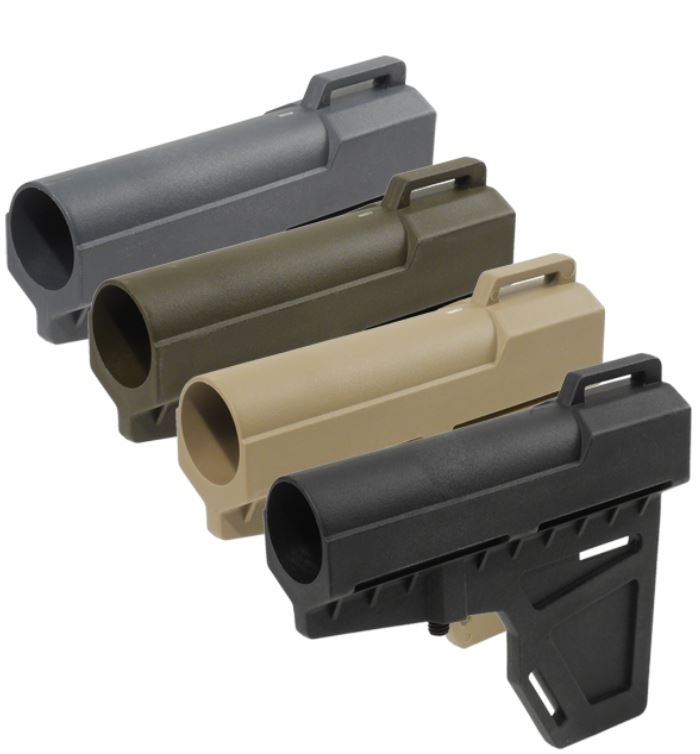 Do you use a pistol brace, and if so, which one? 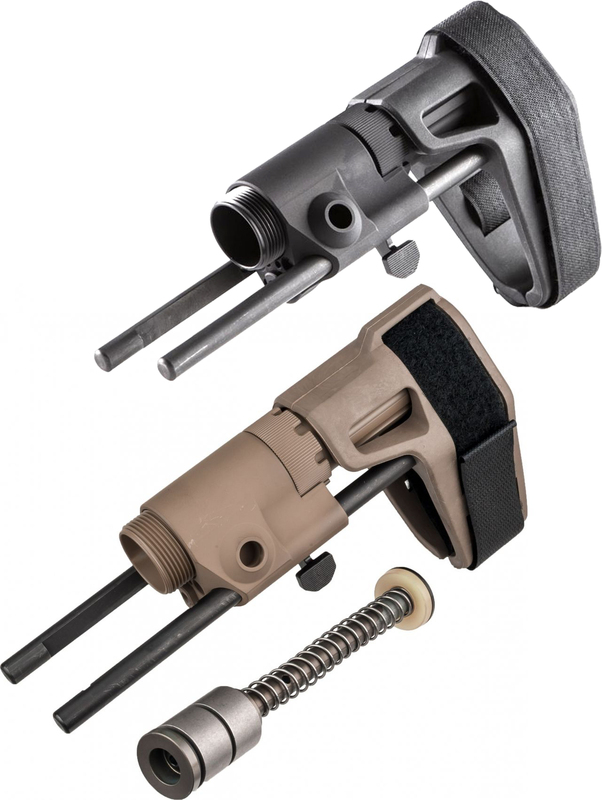 Do any of these pistol braces make you want to try a pistol brace out? Let us know in the comments! Looking to upgrade your AR build? 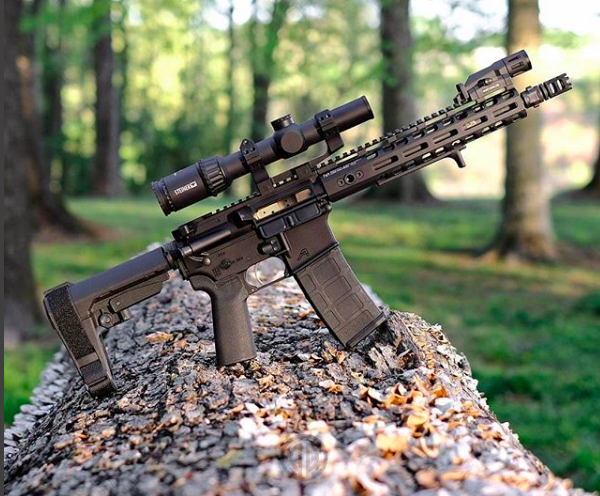 We’ve got you covered with the best AR upgrades–from buttstock to muzzle!